Acer is on a roll at the moment, producing a stream of award winning laptops that regularly put other manufacturers in the shade. The Aspire 5740G-434G64Mn continues this good run of form and, although it doesn't boast the number of features of some others, it remains a very usable machine. As with many Acer laptops in the past, build quality is excellent and this is a laptop built to survive life on the road. The shiny blue lid may attract dust and dirt quickly, but the thickness of the design means good protection for the panel inside. Similarly, the solid plastics the chassis is built from provide excellent protection for the components within. There are a number of hotkeys above the keyboard for fast access to the likes of Bluetooth and a handy back-up assistant, making it easy to save your files and folders to an external drive. There's also a large programmable button whose function you can designate yourself. The keyboard features Acer's unique style, whereby the keys stand up from the board. It's a clever design which makes for an intuitive typing action, but it also means there's an empty space beneath the keys for dust and grime to fall into, so regular cleaning will be required. 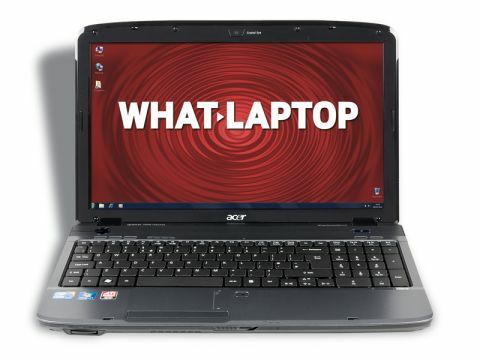 The 15.6-inch screen isn't as sharp or detailed as the Packard Bell or Sony's in this group, but it still features a 1366 x 768 pixel high-definition (HD) resolution. The optical drive is not Blu-ray compatible, however, so you will have to download any HD content you want to watch. Performance-wise the Acer impresses, and its use of an Intel Core i5 processor back up with 4GB or RAM means you'll be able to run resource intensive applications with very little issue. Multimedia tasks will also run with ease, thanks to the powerful ATi graphics card included, although as with all the laptops here you'll struggle to run the latest games with maximum settings. Storage is superb, with the 640GB hard drive providing more than enough space for large photo, music and movie libraries. Unfortunately, portability isn't as good as we would have liked. This laptop is quite heavy and the 176-minute battery life is fairly poor, as we expect a minimum of three hours from a modern laptop. This greatly restricts travel use, making this a machine better suited to desktop use at home. In conclusion, we were suitably impressed by all the Acer Aspire 5740G-434G64Mn has to offer. True, portability is an issue which may put some off, but we feel the power, durability and usability of the machine successfully compensate for this.